An administrative assistant is responsible for various administrative tasks, like planning meetings, organizing appointments, answering phone calls, etc. In this article, we will provide three downloadable administrative assistant cover letter template examples. You can use these templates to formulate your own administrative assistant cover letter that highlights your skills and presents your expectations from the new job. Be prepared to make a few changes here and there, as to fit the nature of your position. Remember an admin assistant cover letter has to match your administrative assistant resume, and help you impress the employer. Following the job advertisement you posted on Indeed, I would like to express my interest in the position of administrative assistant for your company. I have a BA degree in Administrative Leadership from the University of Pennsylvania. In the past, I have worked as an administrative assistant for two other companies, and have experience doing a variety of administrative tasks, like organizing and scheduling meetings and appointments. In my current position at MAXWELL, I am in charge of organizing, filing, and cataloging all documents and data. I also organize meetings, conferences, and team building events for the entire company, and I am in charge of the traveling arrangements for partners and executive managers. Some of my other tasks include creating weekly calendars for future events like team gatherings and conferences, writing periodical reports, business templates, and letters. As an administrative assistant at MAXWELL, I saved the company $10,000 in expenses due to my ability of organizing travel arrangements effectively and efficiently. My job performance has been spotless, and I have also contributed to making other employees valuable to the company. I have led customer service courses to teach staff members how to deal with customers, which led to a 25% increase in customer satisfaction. I possess extensive knowledge of working with Word, Excel, PowerPoint, Access, Publisher, Database, and Peachtree. Moreover, I can quickly learn how to adapt to more specialized software. Other skills that recommend me for the job are my ability to organize meetings and events, manage inventories, handle phone calls, organize travel arrangements, manage databases, process payrolls, and perform front desk duties. As an employee, I can describe myself as outspoken, rational, with a true knack for solving challenging problems. The other qualities that recommend me for a position at your company are my time-management skills, organizational skills, self-dependence, client-orientation, and detail-orientation. It would be a great pleasure to meet with you to discuss the specifics of the job. I believe I would be a great addition to your company. I can bring my administrative assistant experience to benefit the company, and I can grow with the team, while also developing my skills further. If you wish to contact me in order to arrange an interview, please feel free to get in touch with me at the phone number or the e-mail address listed above. After seeing the job advertisement you posted on Indeed, I decided to express my interest in the position of administrative assistant for your company. As a highly competent and skilled administrative assistant, I believe that I would make an excellent addition to your company. I have graduated from the Portland College of Art, with a BA in Contemporary Politics. My career as an administrative assistant began with a job at JOHNSON’S MANAGING. I currently work at a different company, where I am in charge of all administrative tasks, like organizing meetings, answering calls, managing travel budgets, and more. Currently, I am employed at KOONS&Co., occupying the position of administrative assistant. I am in charge of greeting visitors, answering phone calls, coordinating inventory orders, ordering office supplies, training other entry-level administrative assistant, and more. As part of my job description, I am comfortable working in a competitive environment and successfully collaborating with my team members or with clients in order to expedite a project. During my time at KOONS&Co., I have developed and implemented document organization and filing practices that have increased the company’s efficiency. Due to my superior organizational skills, I have saved the company more than $3,000 a year. This has also gained me the respect and appreciation of the company’s executive officer and managing partners, who have recognized my skills and dedication to the company. My job-related qualifications include proficiency in working with MS Office, sorting correspondence, ensuring that the office is adequately supplied, answering phone calls, replying to e-mails, etc. I am also good at data analysis, preparing materials for meetings and presentations, creating daily and monthly reports, and organizing and optimizing the manager’s daily/weekly agenda. I would also like to state that I am energetic and can adapt quickly to any type of workflow. I am hard-working and ambitious, and I have great communication skills. Without a doubt, with the qualifications mentioned above, I believe that I would make an excellent addition to your company. I am eager to find a company that can benefit from my administrative assistant skills, but also teach me how to further develop those skills, and I believe your company is a great fit. Consequently, I am eager to hear from you at your earliest convenience. If you wish to contact me in order to arrange a meeting, please feel free to use any of the two contact details supplied above. I discovered your job advertisement on Indeed, and I would like to express my intention of becoming your newest administrative assistant. If you want your administrative chores handled with the utmost professionalism and promptitude, I am confident that you will find my experience and services suitable for your company. I have graduated from the University of North Dakota, with a BA in Business Administration. My prior work experience as an administrative assistant organizing meetings, scheduling appointments, answering calls, and managing paperwork recommends me for a job at your company. At my current job as an administrative assistant at Barton Schott, I am in charge of organizing the work space, answering incoming calls, sending e-mails, contacting third parties on behalf of the company, assisting my superiors with document filing, recording transcripts from meetings, and more. I also make sure the office is always stocked, and maintain office equipment like printers, computers, and copiers. While working at Barton Schott, I have been awarded the Employee of the Year award due to my outstanding results and excellent work ethic. One of my main achievements was organizing an international event hosted by our company that had over 150 guests from Europe and Canada. These achievements show that I am able to organize large events and have them run smoothly, while also still fulfilling the rest of my tasks as an administrative assistant. I have an impeccable record when it comes to handling the most difficult of office tasks, and I am proficient when it comes to working with computers and specialized software. I know how to organize meetings, manage inventories, distribute correspondence, organize travel plans, record meetings, etc. Furthermore, I also possess strong interpersonal skills, which allow me to negotiate with any customer successfully. I am also a good team player, have a great eye for detail, and can perform above and beyond my duty, even in a high-stress environment. In my opinion, given the skills and qualifications mentioned before, and my competitive and compelling personality, I believe that I will make an excellent addition to your company. I think we could both benefit from each other and grow together as a team. To this end, together with my cover letter, I have also enclosed my resume, and I am eager to hear from you at your earliest convenience. 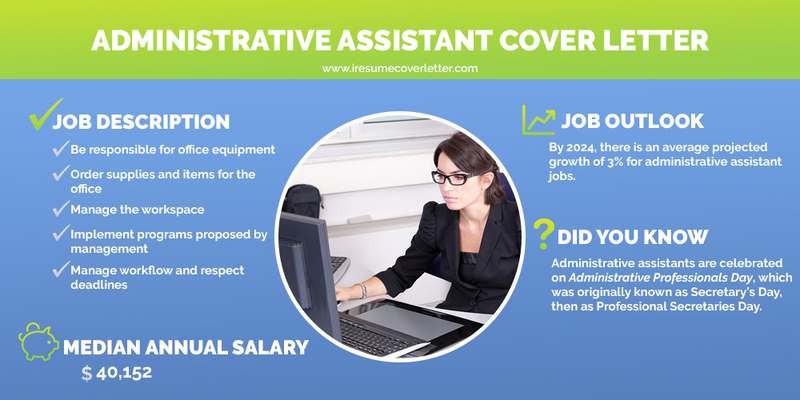 In this article, we have provided three well-balanced administrative assistant cover letter examples. As long as you take the time to carefully personalize your letter, and re-read it once you’re done, your potential employer will appreciate your effort. Don’t forget to include the most essential aspects of any cover letter – the skills and qualifications that make you stand out in the crowd. Good luck with your application!